Fall 2017 - huge regrowth!!! 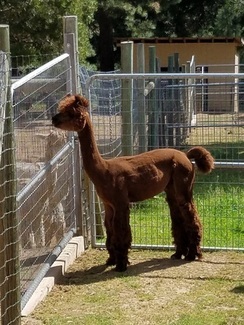 Zahara is a carbon copy full sister to El Dorado Zeena. 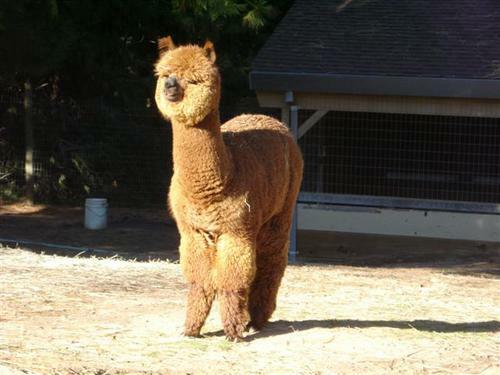 Zahara has given us a beautiful white female out of MFI Peruvian Providence, El Dorado Passion. 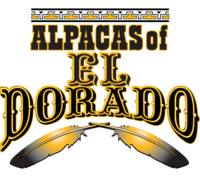 Zahara's 2nd cria, El Dorado Bacardi Gold is an award winner in her own right. Zahara's 2009 fiber stats- Micron 22.1, SD 4.0, CV 18.2%, Staple Length 72.4mm. at 4 years old and a light fawn. This year we are breeding Zahara to RR Guns Ablazin'. 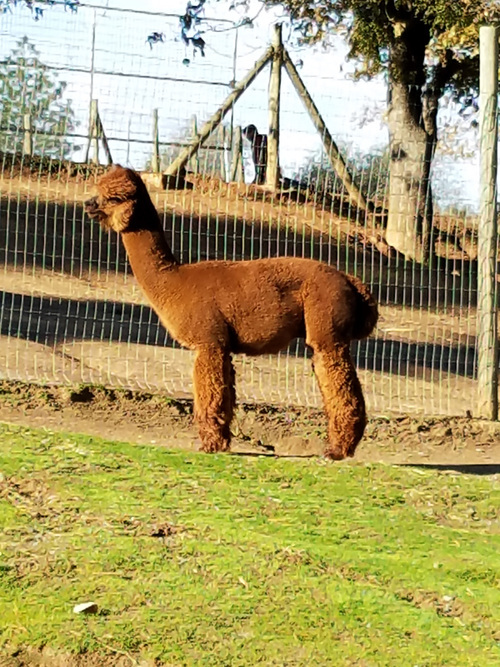 The densest colored alpaca tested in the world. Blaze's follicle density is a 78.3 S/P 11.2. Zahara throws consistent fineness and with Blaze's density, me thinks we'll have a winner. 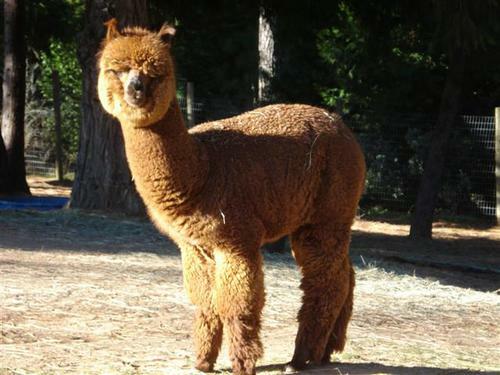 If Zahara is sold and produces a male cria with this breeding we will retain 1/2 interest of the cria. We love this male!!! He is fine with beautiful crimp and style. Dense fleece, beautiful bone, wonderful headstyle. His dam is one of our best, El Dorado Zahara. 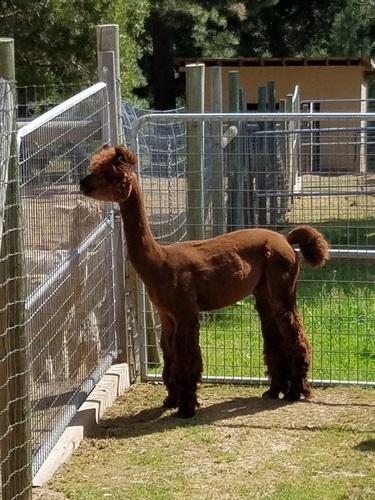 We decided to breed Zahara back to MSA Peruvian Brunello in hopes to get a male. And that is exactly what we got. Tsunami has done well in his first shows and as he matures we will continue to show him. He is much darker than his sire, and much finer. Breeding now, talk to us about multiple discounts in breedings. 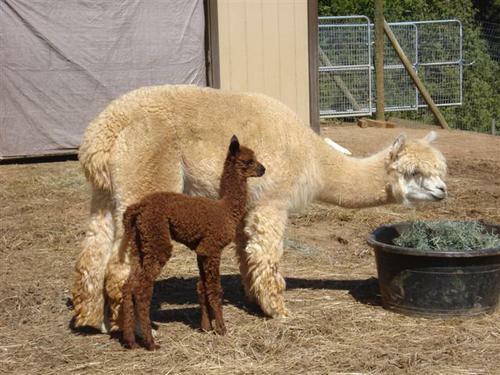 JUST IN...first cria on the ground a dark fawn female out of a white dam!!!! "This fleece is a beautiful rich brown, almost a mahogany. Love it. Great soft hand in this entry. There are well defined staples with good crimp. The staple architecture is open - which gives the fiber a nice loft. and that should translate to the yarn as well." Total points - 81 out of 100. He was faulted on cleanliness which was due to the preparing of the fleece....me. Tsunami received a 1st place!